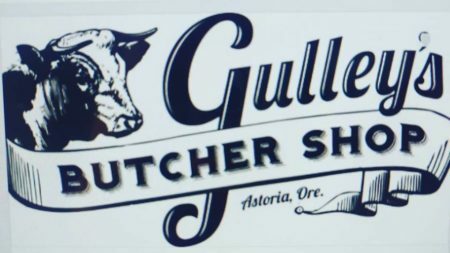 Opening in July 2016, Gulley’s is Astoria’s only source for fresh Oregon beef, pork and lamb of the highest quality. Oregon’s’ own pasture raised, we offer Dry-Aged Laney Farms Beef, Carlton Farms all-natural pork and beef and Anderson Ranches lamb. We also have purely grass fed beef from Backwater farms on Puget Island. Our house made fresh nitrate-free sausages and jerky are the local favorite. We also have amazing Elk and Beef Pepperoni’s and delicious, Willapa Fresh and smoked oysters and smoked salmon. Fresh sandwiches are made daily and by request, with 1/4 pound of deli meat from our full Thumann’s deli. Our deli meats are the highest quality and certified by the American Heart Association. purchase meats and cheeses by the pound, all low sodium, MSG free and amazingly tasty. Glenn, I and our butcher Joshua Null are more than happy to help you select a truly fine cut of meat for dinner and chat about preparation and cooking techniques.